Napping while sitting in a chair next to a person who is speaking and being televised at the same time? I could have nailed that on the campaign trail if I'd only known it was part of the job description. In case you hear about any election results today, Elections Canada wants you to keep it to yourself online. Thanks! Well folks - tomorrow is Voting Day. It's been an amazing experience being your Green Party Candidate. I hope I can count on your support. Think you know my stand on the oil and gas industry? Any of you use Twitter? I'm on there too. 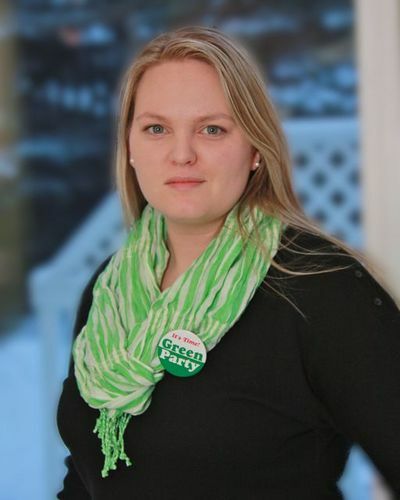 Fave hashtags so far are: #cdnpoli #GPC #elxn41 #yycwest #yycvotes #voteoutanders. What are yours? Something to remember when you read or watch the news. Karl - I liked your article so much I had to share it! It's time to vote out of HOPE and not out of FEAR. Excellent message. Peter Bevan-Baker on why voting Green matters. Parts 1 - 4 of the All Candidates Forum video from this week. Guess who walks out in Part 3? Come on Canada - let's stop legislating with gut instincts and fears and use the research that our tax dollars are paying for. Tough on Crime? Let's Get Smart on Crime. Another reason to vote Green. We're in the health care business, not the prison building and filling business. One of the pics from today. This is at Bowness Park where people were having a BBQ. I love OpenFile. Here's an article by a disenchanted Conservative in Calgary West. Phew! My arm waving muscles are sore! Met a lot of really friendly people this morning on the running path along the river. Thanks for all of your support so far Calgary West! Don't forget to vote on Monday! If you're a Green Party supporter and live in Calgary, you're invited to watch the election results with me and the other candidates on Monday night from 8pm onward (I'll be there around 7:30) at Amsterdam Rhino, 607 11 Ave SW. There will be TVs with the election coverage on and apparently a band. See you there! Missed the forum on Wednesday? Missed your chance to ask Anders a question? It might have been asked by someone else. Video of the forum is uploaded to my site. Hello media bias. My response to the "news" story on CTV today about Calgary West. In case you couldn't make it, video from the 'all candidates forum' that was at the Bow Cliff Seniors Centre this week is being up loaded to my site. You like using Facebook? No 'privacy setting' is going to protect your rights against this. How social media is a game-changer in this election. Hey, check out pics of these people who braved the weather yesterday to show their support! Why would he use the G20 as a reminder of what he's done for Toronto? The G20 is a legacy of human rights violations. I wish this man was running for office. :) We need more people like him getting their message out. Since I'm on a British proportional representation rant tonight, here's another gem. Britain is having a referendum on proportional representation next week - something Canada needs badly. This video explains it so that even cats can understand how PR works. Everything you wanted to know about the GPC in 30 minutes. This is really innovative. Imagine being able to turn your poop into Electricity, Heat, Methane, Fertilizer, and Water. It'd be a whole new world. Even the British are trying to have proportional representation right now, calling it 'Alternative Vote'. Do we really want to be the second last western democracy not to have this? Interesting article in general. Here are the promised photos from today's forum in Calgary West. Enjoy! Video coming soon. Hey Calgary West, there's still time to request a lawn sign! Click on the link to request your sign. Thank you. Mayor Nenshi has a lot of great points about why you should still care about voting even if you're not overly excited about the election. Behind the scenes--Mayor Nenshi says VOTE! Green Party rally on LIVE right now. Oh, and to everyone who's sent me an email in the last three days - I will get back to you. I have today off work so I am hoping to answer at least 50 emails tonight. I'm writing a blog post this afternoon on my reflections of the 'forum' experiences I've had so far. I will let you know when it's done. Calgary West had highest voter turnout in Alberta at advance poll. Thank you for voting! Rob Anders came to the all candidates forum today. I have picture proof and will upload it later. We had a little tete-a-tete before the forum where he let me know that the recent polls indicated that I'm coming in third. I said that I don't trust polls that don't take into account cell phones. Also, I let him in on a secret too - I'm running to win. You deserve increased access to broadband Internet, a competitive market, transparency, and choice. A vote for the me is a vote for the Internet.